Well the news is offically out. 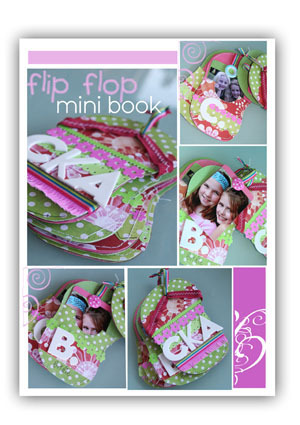 I have stepped down (sadly) from my role on the Scrapboxx DT. It was a big decision. Lots of deliberation. But with my @Home site growing so quickly, it was necessary for me to step back from my Boxx DT committments so I can concentrate on my business.. Even though I know it's the right decision to leave I am still sad. And I can't quite bring myself to remove my Boxx DT link in the sidebar just yet!!! I have lots of friends on the DT (and at the Boxx) and it was always fun working alongside them. I loved choosing new products and pulling together stuff for the newsletter. I was especially sad when I saw the latest Boxx newsletter announcing my resignation and the tribute Maria had generously put together showing some of my work!! You can see it here. So thank you Maria for asking me to join in the fun back in May 2005. Thank you for being such a great person to work for. For being so generous and lovely and kind and professional and accommodating. 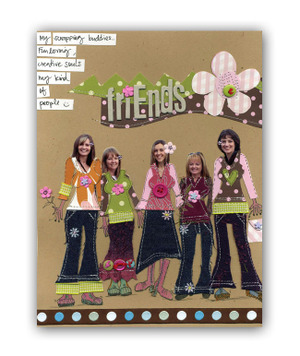 ..to let you know that MARIA IS LOOKING FOR A NEW DESIGN TEAM MEMBER to join us at Scrapboxx. Here's what Maria says..
We currently have an opening on our Design Team. If you are interested in applying, application is simple! - send us via email - three projects that you think show off your style the most - they can be either layouts or off the page projects, they don't need to be new - but they do need to be your original work. 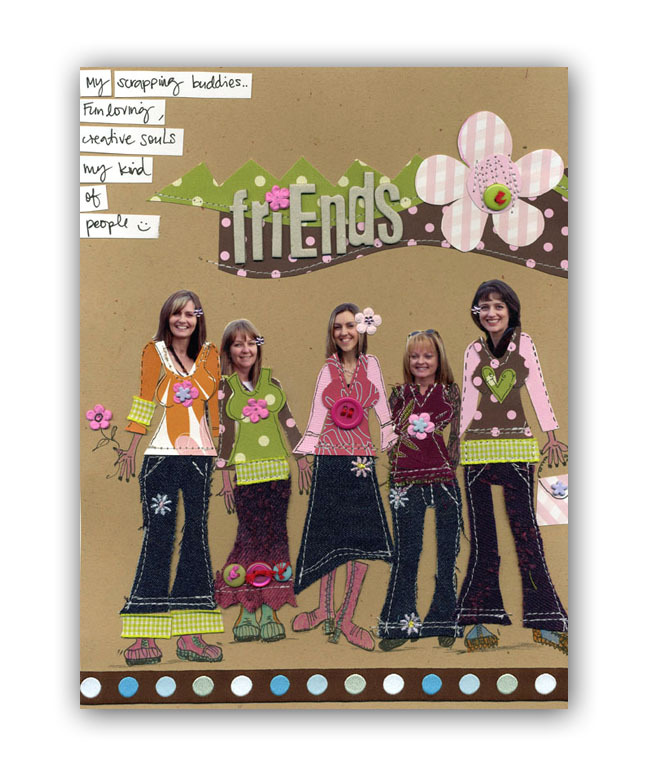 The successful person wil be offered a position on the Scrapboxx Design team - where they will receive generous store discounts, free products, promotion through the site and our newsletters and the opportunity to work along side some fantastic girls! 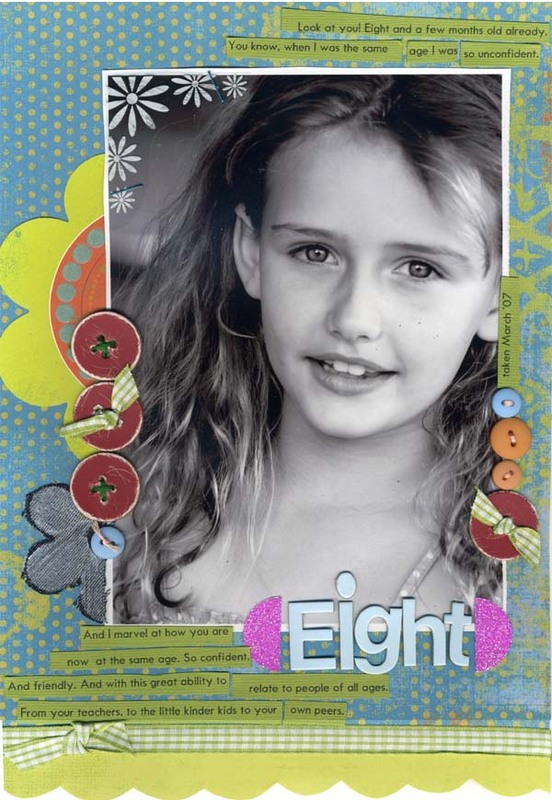 The successful person will also need to be exclusive to Scrapboxx and therefore can not be on any other online store design teams. However, they can be on Local Scrap Shop Design teams, Manufacturing/wholesale and magazine Design Teams. 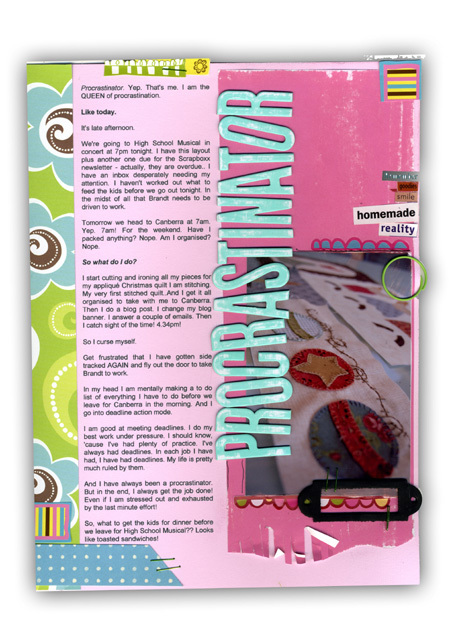 Scrapboxx newsletter is out..here's my latest layout..I am a HUGE procrastinator which is what my journaling is all about in this layout - although I always get the job done especially with a deadline looming..but I do fluff around sometimes instead of getting on with it all! I had this layout due (overdue!!) on the Friday afternoon. The same afternoon we were going to High School Musical. The same afternoon I had other stuff due. And we were heading to Canberra first thing the next morning. In the middle of that the kids needed to be fed before we left for the show and Brandt needed to be driven to work. And I hadn't even STARTED packing for Canberra. So what do you do when you have a to do list as long as your arm to get through? You trace and cut out all your patchwork quilt applique shapes ready to take to Canberra to stitch while you are away!!! You do a blog post and you design a new blog banner. So that made a great subject for the theme of 'habits' I had for the newsletter and I got the layout finished. And I got Brandt to work. And the kids got fed before High School Musical. And I packed and we managed to still get out of the house and on the road to Canberra by 8.20am Saturday morning. A mighty fine effort if I do say so myself! Now, for the family. Some pics from Canberra. Yep. A while ago now but I still want to add these photos in! Our visit to Canberra was certainly a flying visit but we managed to pack quite a lot into the few days we were there. Kids got to catch up with their cousins. We caught up with family. And we spent a great afternoon/dinner with our lovely farm friends Rob, Lyn and kids! Always great to see them. And breathe in the country air. Lyn is Mrs Crafty Queen and I LOVED checking out all her beautiful patchwork pieces especially now I have a new found interest in stitching!!! She creates the most gorgeous stitched projects (and teddies!!) and her home is filled with craftiness!! 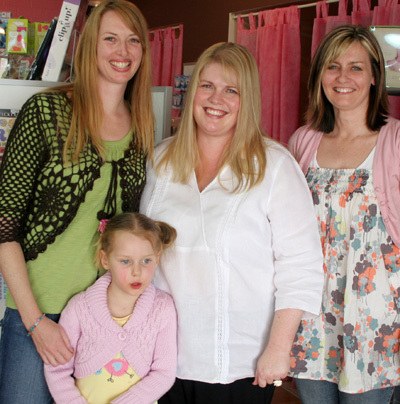 I met Lyn and her girls, with Capri at Ainslee's brand new scrapbook store..Scrap Junkie. Such a lovely location!! And a great new premises for Ainslee. PLUS HUGE bonus- I got to meet Yvette!! For the very first time. And she's tall. Mega tall. And strikingly gorgeous!! And such a lovely girl! One of those people you instantly warm to. I felt like I could sit and chat with her all day!!! I also got to meet Tassy!! And she was a lovely thing too - full of personality!! Lyn generously took Capri and her girls for a drive for an ice cream so I could have some time visiting with Yvette at the shop. Ainslee made us a cuppa and we got to have a really good chat!! And some shopping of course! And here we are with Ainslee..and Tassy too. We also went to the Kingston markets - always love visiting there. And out for dinner to APK Pizza Kitchen - another fave spot. And out for drinks for Ken's cousin Corinne's hubby's birthday (try and say that fast!) at their new pub they have just bought. And coffee at Kingston with Ken's sister and her kids. All in all. Quite a social three days! 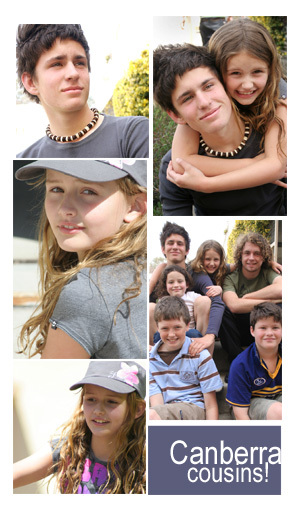 here's a few pics of the kids and their cousins..
And thats all for now. Tomorrow I have some news. And a little comp. Details tomorrow morning! 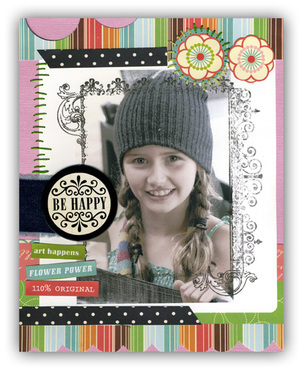 Hot off the press...latest issue of the Scrapboxx newsletter...view it here. 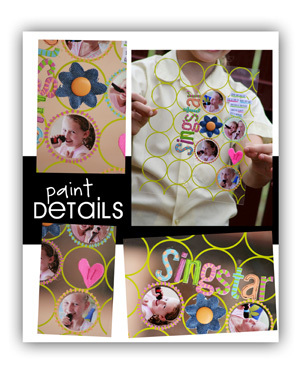 Here's my layout...photos of Chelsea...lots of circles!! I've wanted to machine stitch on the thicker stickers for a while..was a bit tricky but I like how they turned out. So, how about Idol!! I'm enjoying it already. I do love my reality TV! Pathetically so. 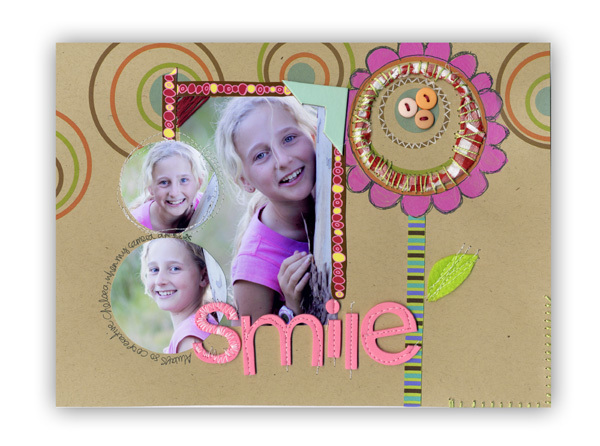 I had a couple of things in there..here's one of my layouts..for the Back to Basix feature..I had to create a layout under $5 which was a bit of a challenge :) Photo printed onto cardstock plus some Photoshop brushwork! Well, we're off to netball training for Capri! Enjoy your Wednesday. IT'S BEEN A BIG FEW DAYS! Well I am on a steep learning curve. But it's fun! And the website response has been excellent. Read about it and also a few updates over at the @Home blog! I have a couple of things to share from the latest Scrapboxx newsletter. 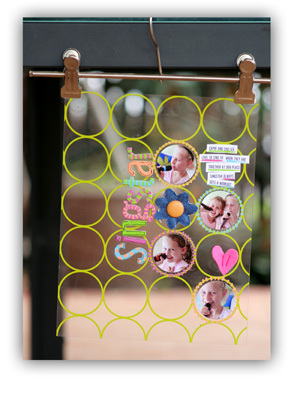 Read the newsletter here.. Scrapboxx turns THREE THIS MONTH!! yay! Congrats to Maria on such a great achievement..Maria has planned lots of exciting things this month to celebrate which you can read about in the newsletter as well. Usig the Hambly transparencies as my background and lots of circular photos! Here's a shot of the close up detail.. In other news...Brandt was nominated and voted in as a Tutor Group Rep at a ceremony at his school last week which is great!! Of course in true Brandt style he is playing it down and wouldn't even let me take a photo of him wearing his badge! He was also awarded a certificate of excellence for construction yesterday - one of only two kids to get an award in that subject! Again, he's downplayed it and there was NO chance of getting a photo of him smiling and proudly holding his award. In fact NO chance of even getting a photo of the award! NO co-operation at all! And I think thats about all my show and tell for now. Enjoy the rest of the week everyone. 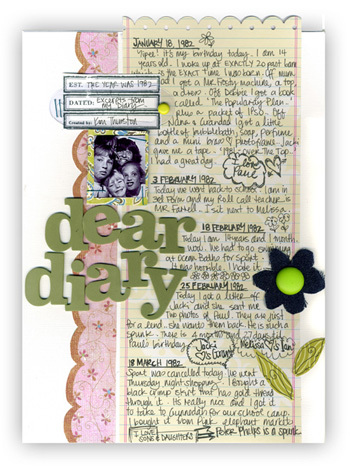 I found my 1982 diary recently which prompted my STEP BACK IN TIME online workshop..I then decided to incorporate some of the diary entries into a layout. Throughout the diary theres lots of scribbling and love hearts and doodling so I included those on my layout also. Photo is of me and my sister(who is hiding up the back!!) and my cousins. The little blond one at the front is Kristy - the one who got married recently and her two sisters Jacki and Jodi!!! I would have liked to have fitted in more entries but space was limited so I plan to add another page and more entries eventually! Most of the diary entires are full of rubbish! Who loves who. And stuff from school and the bus. I really did go on and on!! 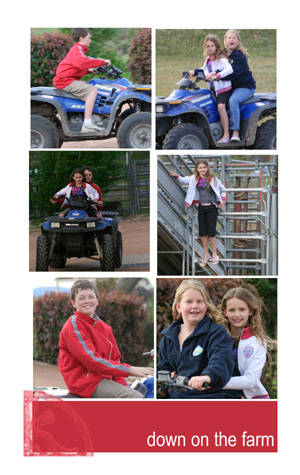 But it's interesting to look back and read about our school camp to Gunnedah. And that I was deeply in love with Paul. And that I got a Mr Frosty - so embarrassing - for my 14th birthday(I had wanted one for soooo long but by the time I got one I was a tad too old!!!). And that we gave my dad a packet of cigarettes, a packet of tic tacs and some slacks (mmm niiice) for his 38th birthday! What a selection of stylish presents! And that I went to the movies to see Creep Show with Margaret and we were scared out of our wits and had to leave early! We were so brave. And that I was in year nine and my roll call teacher was Mr Farrell and I sit next to Melissa! And so on. Marie and I saw Because I told You..I think that was the name of it. With Dianne Keaton (she is great!! ), Mandy Moore and the girl from the Gilmore Girls. Was a nice, light piece of escapism! PS if you can't read the journaling, let me know and I will type in the journaling into this post. 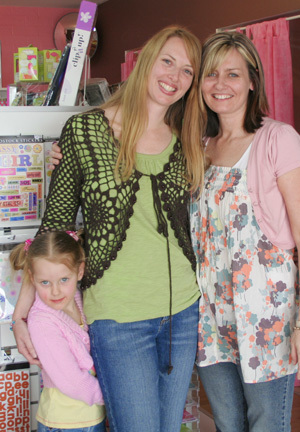 So ages ago Julie (who I might add has unlocked her blog so you can access it again without a password...yay!!) and I did a photo swap. I am embarassed to admit HOW long ago our swap was. 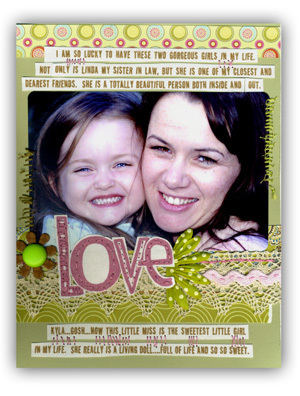 I have had my beautifully created layout from Julie for agggggess now..and it was about time I got my act together!! 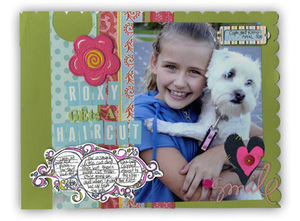 and also a layout of Capri and Roxy. We sent Roxy for a cut and style the other week and again, she came home with more cut than style!!!!! We were VERY specific about what we wanted and didn't want her shaved almost back to her skin...which is what they did. She wasn't knotted or matted as we had been really good at grooming her - well Ken was! So I was SHOCKED when I picked her up afterwards and discovered her face was still fluffy but her body looked like a skinned rabbit!!!! She looks quite hilarious although she needed that inbuilt fur coat as the weather is getting cooler....but it will grow and in the meantime...she is sporting a VERY fashionable and stylish knitted coat! And also on this layout is one of Zina's new journaling stamps!! Very cool! ....to the lovely Miss Simone Neville. Come on doooowwwwwn! During last years Christmas extravaganza online class week Capri and Jemima helped me out with doing the draw for some lucky door prizes. One of the winners was Simone. 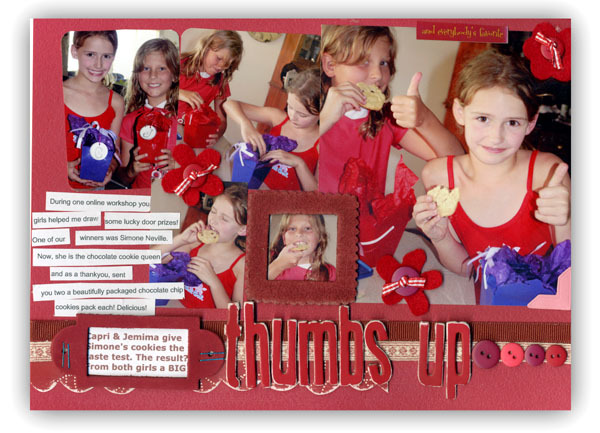 As a thankyou, Simone sent up some beautifully packaged cookies for each of the girls. They were very excited, took the taste test and gave Simone a BIG THUMBS UP! 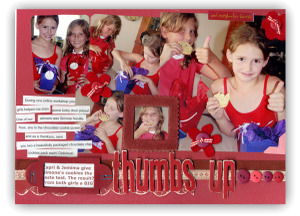 I had to do a RED layout for the newsletter. Now I can handle a splash or red here and there in my work BUT I have never created a completely, totally RED MONOTONE layout! So this was quite a challenge.When I started choosing all my red products for this project I realised just HOW MANY SHADES OF RED THERE ARE!!! And finally, I have to send a BIG THANK YOU to Susan from NY. Now I have gotten to know Susan a bit over the past few months as she has been taking my online classes and we have had a few chats and she is a lovely generous girl!! And as a surprise, she sent me this! 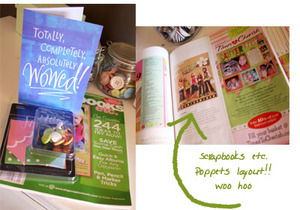 The latest Scrapbooks etc magazine, a congrats card plus some Heidi goodies. And why? Because she spotted my poppets layout in the magazine and knew it was my first time published in a US magazine!!! Another Scrapboxx newsletter is out and you can see it here. I had a couple of things in there..
And my take on Erica's sketch layout..